Mr. Morris Schwartz worked as a darkroom operator at The New York Times from 1922 to 1926. From then on he worked together with his brother Hyman, at the Jewish Daily Forward in New York as a photographer until 1931, before starting his career as a camera manufacturer. Following his tenure at the Jewish Daily Forward, Mr. Schwartz founded the Kalart Company, which manufactured photography products. 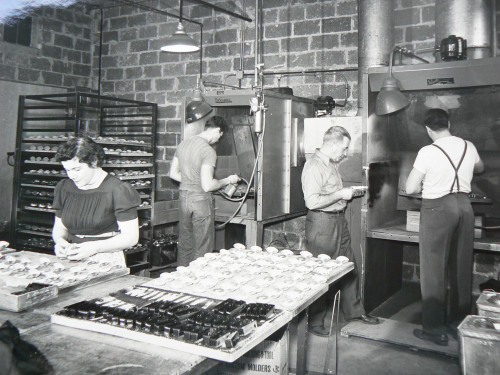 The company won an award of excellence from President Lyndon Johnson. He became the inventor of the Kalart Range finder with an 8th grade education. Mr. Schwartz died on October 22 in 2004 in his home in Laguna Woods, California and is survived by a son, Charles Schwartz, three grandchildren, two great grandchildren, and his brother Hy Schwartz. Mr. Schwartz was born in Russia in 1901 and came to America in 1906 with his parents. Mr. Morris Schwartz's first invention in 1930. Thanks to Mr. Hy Schwartz who supplied me with several interesting details. The Kalart Camera was designed by men who started their business careers as Photographers, not as camera manufacturers. As such their knowledge of cameras and camera limitations was initiated and developed in terms of practical picture taking. In designing and producing this Kalart Camera, their only goal was to overcome the technical handicaps that beset the photographer in that period of time directly after World War II. 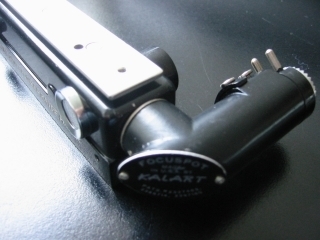 The first product of the young Kalart Company was the Kalart Speed Flash. This flash helped the professional photographer to minimize the problem of insufficient light and incorrect exposure. Next in order was the famous Kalart Synchronized Prism Range Finder for instant, automatic, exact focus, eliminating the necessity for ground glass or guess focusing. This product was followed with the Kalart Focuspot make night focusing as speedy and accurate as day focusing with the Kalart Range Finder. The Kalart Range Finder can be found on practically every Press camera during and after World War II. Even on the pre war imported German cameras, the Kalart Range Finder often was available as an accessory. 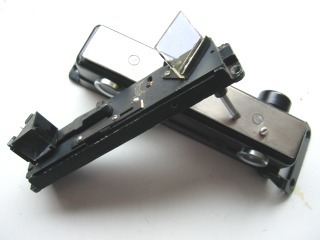 The Focuspot was the third invention to help the professional photographer to focus even in difficult circumstances. The Focuspot mounted on top of the Kalart Rangefinder. The light of the built in bulb is partly reflected by the mirror and partly by the prism and thus projecting the tread of the bulb on the subject. While focusing the lower thread and the upper thread will come together and the camera is in focus.